Whoo hoo! Day 2 of and I sure lucked out with today’s prompt: Write a poem inspired by a myth or legend. Having lived for a while in Mexico, I’d heard stories of a sad, ghost-woman who searches throughout Latin America and the Southwest U.S. for the souls of her two children she drowned out of heartbreak, depression, the blocked flow of her own creativity, or revenge. It depended on who was doing the telling. But I really became interested after hearing Llasa de Sela sing “La Llorona” on a small stage in Vancouver, B.C. Through the magic of her voice Llasa seemed to become La Llorona, moving everyone in the audience to tears. Click here to watch a video of beautiful Llasa singing that song. Later, I discovered several other versions of “La Llorona” sung by Natalia Doco of Argentina, Chavela Vargas of Mexico (who sang in the movie Frida), and Joan Baez from the good old US of A. Just click on the names to view the videos. 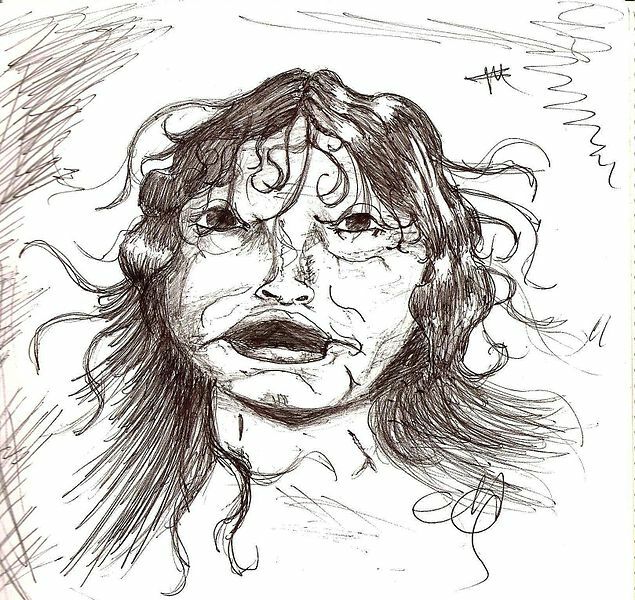 Thank you Wikimedia Commons for the wonderful drawing of La Llorona. Enjoying your poetry! Good for you. Thank you, cyclinggrandma! I sure am having fun. Beautiful! Again, you captured a moment and a feeling, so very sad. Oddly, this poetry-a-day is a thang I am enjoying! (For those of you who will think I am saying something negative here I am not — I’ve never been a poetry reading fan.) I even visited another poet’s page! Soon we’ll be trading poems, Kate! Glad you’re having a bit of a treat. You have a very nice site. Impressive! Thanks for dropping by Yatesian. I look forward to exploring yours. A haunting tale of woe, Llorona is as haunted as she is a haunter. Llasa is sadly missed! So true…I’m forever glad to have been able to see her perform in the flesh…Llasa, that is. La Llorona can go back to sleep. Hola. . . wonderful poem about La Llorona. I invite you to visit my blog and read about my life with her, and how she called me to be a Curandera/Spirit Medium. Please feel free to share your impressions in a comment or question. I look forward to an exchange and to reading more of your writing. Hola, Mari. Thank you for visiting and I’m pleased you enjoyed La Llorona. I made a visit to your blog and read Part 1, found it an extraordinary retelling and want to read more, but Part 2 seemed to be missing. Looking forward to learning more about your journey. All the best. ← Wild Night! Wild Night!